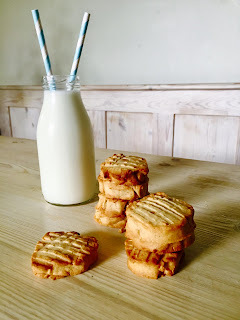 Really simple cupboard staple biscuits. They're melt in the mouth but also will hold together enough to dip in your coffee or tea. You will also need 2 lined baking trays. Cream together the peanut butter, butter, sugar and vanilla together in the bowl of a food processor (or freestanding mixer, or by hand) until light and fluffy. Add the egg, pulse until well combined. Add the flour and pulse until it comes together to form a ball. Tip the mixture out onto a sheet of baking parchment, mix in the chopped peanuts. Roll into a cylinder and wrap in the parchment. Chill until firm, for a minimum of 60 minutes. 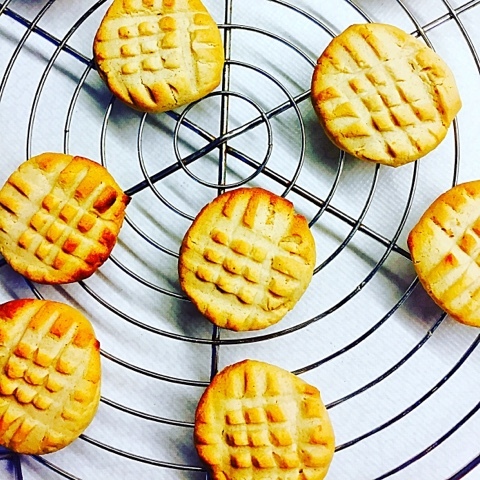 Cut into thickish disc's, place onto the lined baking sheets, use a fork to make a criss cross effect on the tops. Bake the biscuits on the middle shelf of the preheated oven for 10-12 minutes. Leave to cool on the baking tray for 5 minutes before transferring to a wire rack to cool completely.